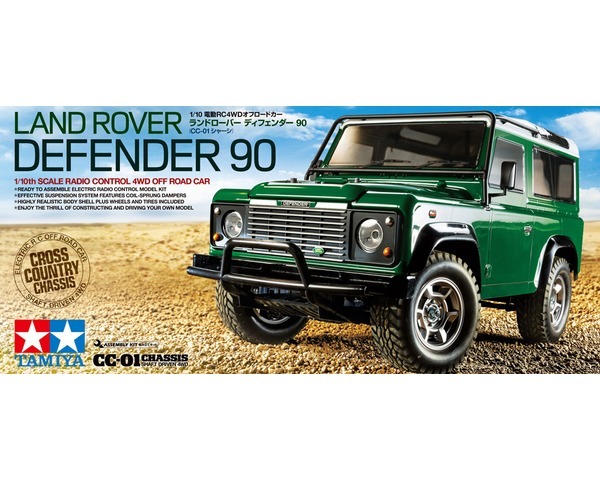 This is a radio control assembly kit of the Land Rover Defender. It is an enduring vehicle that traces its lineage back to the original Land Rover cars first released in the immediate post-WWII era. This model recreates an early version of the Defender 90 (named on account of its wheelbase length), the shorter wheelbase variant of the car. Excellent ground-hugging, long-stroke suspension system consists of front double wishbone and rear 4-link rigid setups and is equipped with 4 oil dampers. Highly reliable and efficient full-time 4WD system features a front-mounted motor, which transmits power to the front wheels via the gearbox and to the rear wheels via the propeller shaft with universal joints. Front and rear differentials enable smooth cornering. For even greater off-road performance on rough terrain, the rear differential may be locked during assembly. R/C equipment (transmitter, servo), battery pack and charger to complete and Tamiya PS spray paint. Assembly required. Molded ABS plastic parts for grille, side mirrors, light cases and tire cover. Full-time 4WD system, front double wishbone, rear 4-link suspension. Matte plated wheels are paired with realistic tires.